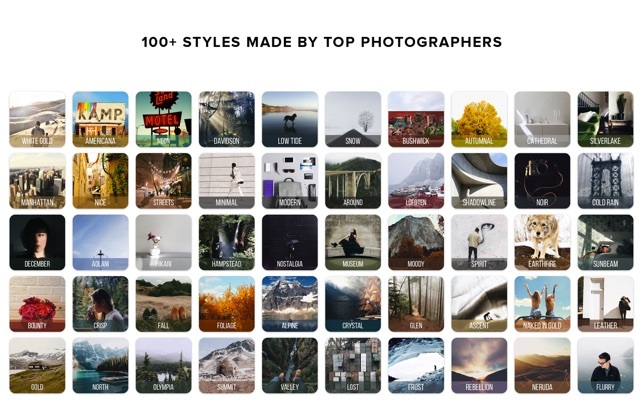 Apply professional photo presets created and used by the world’s best modern day photographers. - Featuring over 100 photo styles: Apply professional-grade photo styles (also known as presets or filters), which are created in collaboration with the world’s top photographers in the form of their photographic styles. All styles are already bundled with the app purchase! 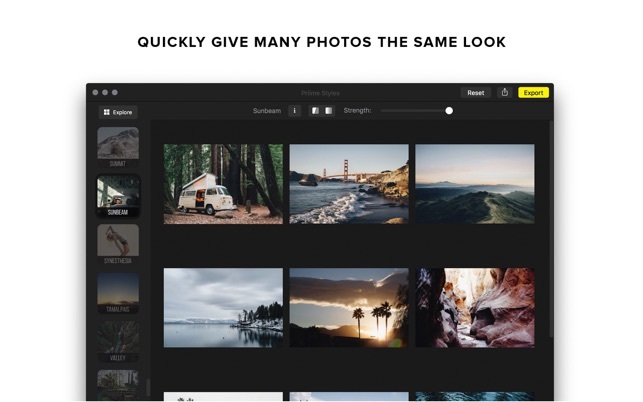 - Standalone: Works without requiring any other programs to add a style to one or many photos all at once. 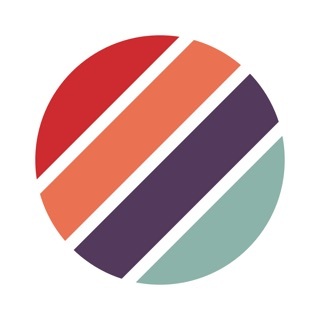 - Photos.app: Elegant integration into the Photos.app’s editing flow, saving back non-destructive max resolution photos. Happily works with iCloud as well. - Lightroom: Total integration with Lightroom photo catalogs. Edit any type of supported photo using your existing catalog, straight from Lightroom. 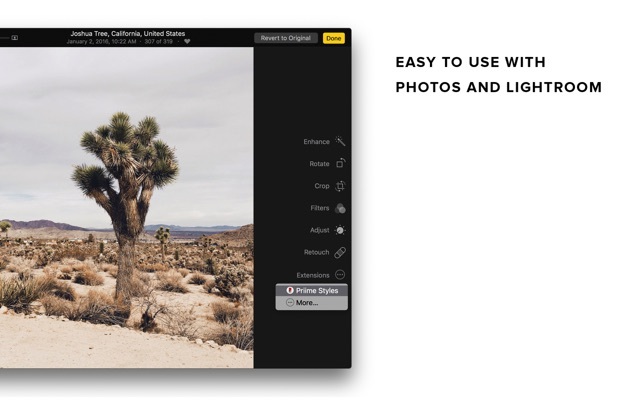 Priime isn't simply a preset, but a whole new powerful tool that integrates into the flow of Lightroom as an external editor, while maintaining the organization of your Lightroom catalog. - Batch editing: To create a consistent style across your photos, editing multiple photos in a batch is available to quickly apply styles to any number of different photos all at once, whether as a standalone app or by selecting multiple photos within a Lightroom catalog and using Priime as an integrated external editor. 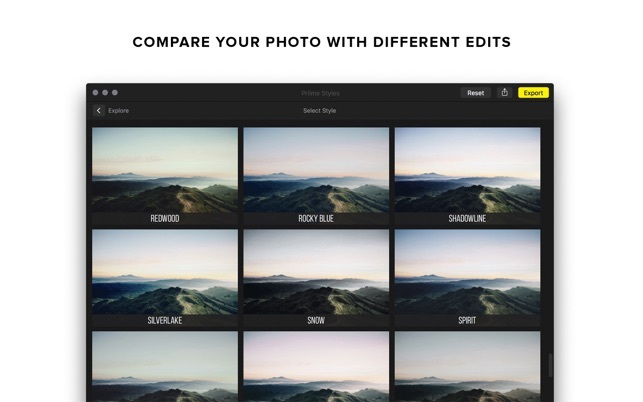 - Big picture workflow: The explore feature of the app allows you to preview your photo as a grid, already pre-edited with all the styles. This new workflow allows you to easily select the look you want, without having to tap through every single option. This app crashes constantly—something is fundamentally broken with it. It’s a deeply disappointing performance for the $30 price. Given that the last update was months ago and the problem remains, Apple should probably de-list it. It’s a shame the developers appear to have given up, because Priime Styles is otherwise a conceptually *fantastic* tool. 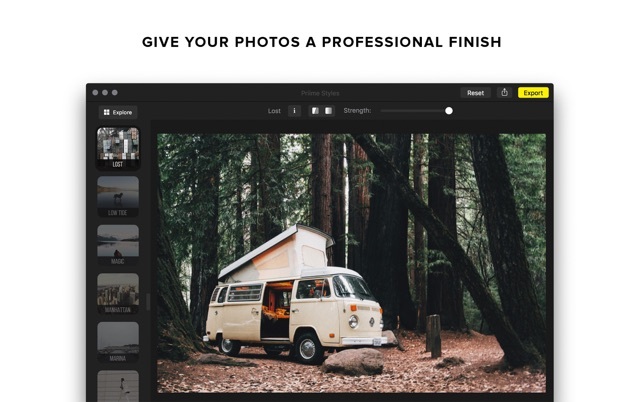 The copious photographic styles are gorgeous; the UI is slick and fast with great keyboard shortcuts; batch processing is a breeze; and Lightroom integration is superb. The styles are even well-documented with examples and suggested uses you can pop-up any time, and there’s a nice quick tutorial to start. It’d be a real winner and worth every penny if it’d stay open for more than one or two photo edits. As it stands, it is *not* worth the price of admission—it just doesn’t work. If it were possible to get a refund, I’d want one. Gave the app a try today because I wanted to apply some nice styles to a bunch of photos, but unfortunately the app crashed every time I loaded a new photo and browsed through a few styles. I was simply loading jpgs from an iPhone, so I would have expected the app to work just fine. Sadly, it did not. It’s really too bad since I know the preset filters are all great, but if I can’t even load a single photo, I’m not sure what value there is in the app. Would love an update from the developer, or explanation, or workaround… anything. I really liked this app and its excellent work flow with Lightroom except Priime keeps crashing. It gets so bad I can’t use it anymore and have to shut down and restart all over. It makes it so difficult and frustrating. I am now uninstalling and reinstalling for the third time, hoping that “fixes” it enough so I can continue working. Since this is a $30 app, it really should be fixed ASAP.